When last we covered the Legion of Super-Heroes that hooked me in the 1980’s, Karate Kid heroically sacrificed himself to try to stop the Legion of Super-Villains. In this issue, we finally see how that went. However, given that Orando, the home world of his wife, Projectra, has been taken to a limbo between universes by the Villains, it might have been in vain. Of course, I didn’t read this until several months, maybe years afterwards. I lived in a little town in western North Carolina at the time that didn’t have a direct market comic shop. All of my comics were bought from the newsstand, most often a little convenience store called The Colonel’s Pantry because of its proximity to a Kentucky Fried Chicken. That store is still in business, although in a different location. Given the dearth of spinner racks in convenience stores in general, I doubt they still have comics, but I could be wrong. Karate Kid lies dead in the arms of his wife, Queen Projectra of Orando. The Legion of Super-Villains approach her carrying unconscious Legionnaires. She tells them all to get off of her planet. They laugh at her and neutralize her powers. Returning to Orando, Lightning Lass observes this and resolves to help her friends, despite the odds. The Super-Villains are expecting their teammates returning victorious from ambushing Legionnaires in the space near Orando’s former location. When Lightning Lass emerges, they attack but are fended off by Lightning Lord. He claims the sole right to kill his sister. Back where Orando used to be, Science Police officer GiGi Cusinamo arrives and informs the remaining Legionnaires that they’ve been ordered to return to Earth. Dream Girl orders Brainiac 5, Sun Boy, Mon-El, and Shadow Lass to stay, in case the Super-Villains return. On Orando, Lightning Lord learns that Lightning Lass has her lightning powers back, and raves at her for refusing to join him. He refuses help from the other Super-Villains. With help from a lightning bolt from above, she takes her brother down, but is now alone against the remaining Super-Villains. Then Element Lad and the other Legionnaires regain consciousness and take out most of the Villains by changing the oxygen in the air around them into Helium. Unfortunately, Ol-Vir is not affected and Nemesis Kid was outside the sphere of helium Element Lad created. Projectra claims Nemesis Kid for herself. Ol-Vir attacks the others. Ultra Boy stops him using his invulnerability. Element Lad changes Ol-Vir’s clothes to lead, poisonous to Daxamites, which sends him flying off of Orando, screaming in pain. Mist Master, Ron-Karr, and Radiation Roy run out to assist their teammates, but seeing themselves out-powered and outnumbered, run away into the ship Lightning Lass brought back to Orando. Magno Lad and Lazon are easily beaten. As Shrinking Violet bests Micro Lad, Zymyr decides to abandon the Super-Villains and warp home, not realizing that he’s taking Lightning Lass and Lightning Lord with him. Projectra uses her powers, but Nemesis Kid develops an immunity to them. Smugly, he strikes the Queen. Then he is frightened by the resolve and rage he sees in her defiant eyes. Projectra grabs him by the throat and declares her authority as a queen. She calls him an animal in human form and snaps his neck. She tells the Legionnaires that it was her royal privilege to kill him. Back where Orando used to be, the Super-Villains that fled Orando are captured by the Legionnaires Dream Girl left behind. Ron Karr tells Brainiac 5 that Orando is being taken to another universe, and they don’t know how to get there, especially with Zymyr’s ship wrecked. Brainiac 5 fails to deduce the Gil’Dishpan machinery, leaving the Legionnaires frustrated. Element Lad’s team is on their own. On Orando, Projectra gives Karate Kid a hero’s funeral and proclaims that Orando will continue it’s journey to another universe, leaving the one that brought it so much suffering behind. She leaves the Legionnaires and the beaten Super-Villains to make their way home, leaving her flight ring with Element Lad as a symbolic gesture of leaving her life as a Legionnaire behind. Esper Lass sends a telepathic message to the Legionnaires that she can operate Zymyr’s machinery, having pulled it from him telepathically. They vanish and the five Legionairres are adrift in Limbo. An Orando soldier comes across Nemesis Kid’s corpse in the garbage and wonders what was so important for all of this killing to happen. As I remembered it, I din’t care for the way this big story concluded. After rereading for this review, I’ve changed my mind. Levitz juggled the characters well in this issue. The villains suffer from a smugness in their powers, which prove to be their undoing. Nemesis Kid demonstrates a reliance on his powers, which specifically shows in how quickly he folds when facing an opponent that isn’t relying solely on their powers. Nemesis Kid adapted immunity and fell to Projectra’s resolve and abilities past her illusion casting ability. 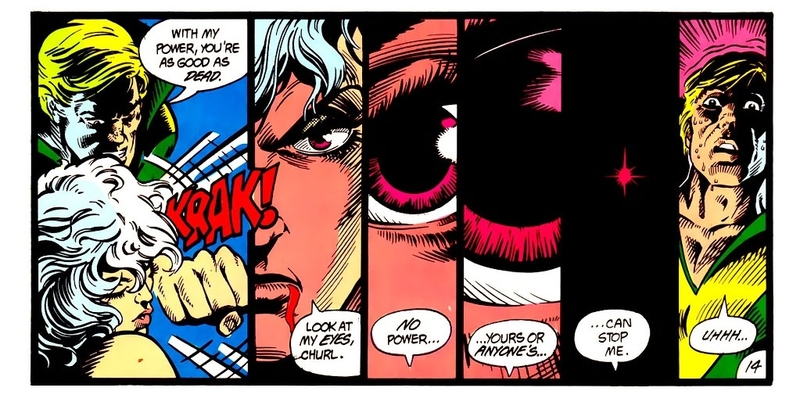 Levitz correctly rationalizes Projectra’s motivation in killing Nemesis Kid as an execution by the government of Orando. The fact that Projectra is the head of that government as a traditional medieval-style monarch gives this rationale validity. The Legion Code isn’t broken here, since she is also a former Legionnaire. This gets revisited and explained away in about two years when Projectra rejoins the Legion as Sensor Girl. However, knowing that Sensor Girl was supposed to be a de-powered Supergirl, I cannot guess that this is a purposeful addition for that subplot. Instead, it was something that had to be addressed after it was revealed that Sensor Girl was Projectra. Steve Lightle’s artwork is a little more of a natural fit here. Keith Giffen’s layout style is evident in places, but Lightle’s style shines through. He renders the Orando armor that Keith Giffen designed years ago accurately, which is daunting given how cumbersome it looks. The only primary issue that I have is with the extreme closeup of the eye he uses in the sequence I’ve shared below. It’s where Nemesis Kid realizes Projectra’s desire for justice and vengeance. The fact that we get several panels that transition to this closeup helps the effort, but the trope always sits poorly with me. I also don’t feel like the shots could have been done better by not including it, proving that sometimes the best choice for the shot is handling the extreme closeup of the eye in a way that serves the story. If you’re looking for the issue itself, then you should be able to find it with a little searching. Don’t pay more than a few dollars for it, as you can probably find a copy in bargain boxes. I fyou want to read it digitally, you can find it on Comixology. 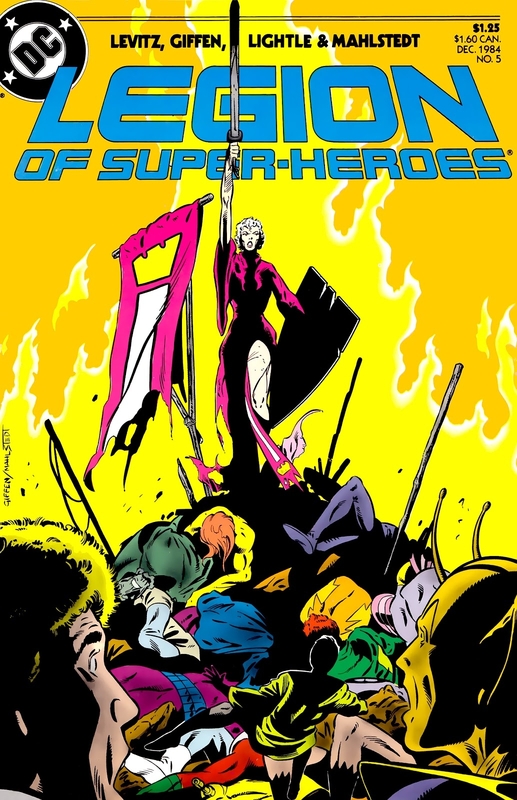 This issue has been collected in Legion of Super-Heroes: An Eye for an Eye (ISBN: 1401215696) Look for it, as this story is on par with The Great Darkness Saga (ISBN: 1401244165).